Once belonging to the monastery of St Augustine in Canterbury, this manuscript has a collection of saints' lives, all of them associated with Canterbury. Several of the lives are the work of the biographer Goscelin, a Flemish benedictine monk who came to England with Hermann, Bishop of Salisbury, probably in 1053. He went on the road to gather material from all over the kingdom, writing the lives of the English saints as he travelled, finally settling at Canterbury. 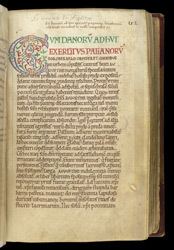 This manuscript may have been copied within a decade of his death, at Canterbury, making it an important record of his work and evidence of the cults of saints there. Goscelin's most important work was his 'Life of St Augustine', which he wrote in minor and major versions. The second part of the major 'Life', the 'Miracles of Saint Augustine', tells of the holiness of the Roman monk, St Augustine, sent by Pope Gregory the Great to convert the Anglo-Saxons. It begins with Augustine's arrival in Dorobernin, as the Britons called Canterbury ('Kent City' to the Anglo-Saxons), where he established a monastery and centre of his missionary activities. This account of his miracles would have been written to advertise Canterbury's upper-level contacts with heavenly power via its apostle sent by St Peter's successor. Goscelin had witnessed the translation or removal of Augustine's relics to a new tomb-shrine in 1091, within ten or twenty years of the making of this copy of the miracles.